Québécois director Denis Villeneuve is more of a regular at the Cannes Festival than on the Lido (he has shown no less than four films on the Croisette), but this year his Arrival had its world premiere here in Venice. After the emotional family backstories of Incendies, the gut-wrenching thriller Prisoners and the dark cartel procedural Sicario , the Canadian director treads new territory with this adaptation of Ted Chiang’s science fiction novella The Story of Your Life which conjures a “first contact” scenario in which sky scraper-sized alien crafts suddenly land in 12 locations around the world. Humanity is, needless to say, awestruck and terrified in equal proportion and the appearance of the alien vessels sets in motion riots, stock market crashes, religious conversions and panic: all the expected excesses of an immature race. Meantime the US army, in the person of colonel Weber (an appropriately no nonsense Forrest Whitaker) is tasked with establishing communications with the pod which hovers over Montana and which like its companion ships remains unnervingly silent. In fact the military of a handful of countries have indeed a visual on the space crafts’ occupants. These are giant “heptapods” (and if you remember your Greek, you’ll know that they possess just enough appendages to avoid being called octopi). In order to begin talking with the visitors, Weber acquires the services of Dr. Louise Banks, the country’s most brilliant linguist and occasional State department consultant. With an elite group of scientists which includes brilliant mathematician Ian Donnelly (Jeremy Renner), she is whisked to the advanced camp from where humans are allowed to enter the spaceship’s hold and try to communicate with the creatures and ascertain their intentions – just like counterparts are doing in Russia, China, Australia and a handful of other nations. Amy Adams and the alien craft in Arrival. Things don’t go great initially as the aliens’ “language” appears to be far more complex than even the most obscure dialects which Dr. Banks has come across. But with time the semantic pieces begin to add up in ways more surprising than anyone could have expected, setting up a race to achieve interspecies communication before the Earthlings begin turning upon each other fueled by suspicion and ancient distrusts, as they are wont to do. If Close Encounters of the Third Kind is a modern benchmark for alien contact movies, Arrival is a relative of sorts of that Spielberg film but closer still to Contact. 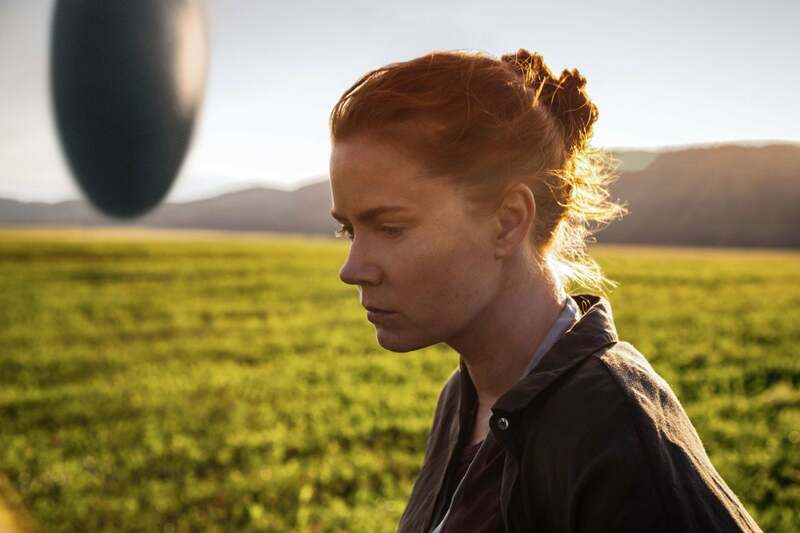 To begin with, like that Robert Zemeckis science thriller based on the scientifically plausible writings of Carl Sagan, Arrival’s core revolves around a strong heroine. And this is definitely a thinking persons sci-fi. Suffice it to say that a crucial plot development has to do with a theory termed Whorf-Sapir hypothesis (a big hit in linguistics and cultural anthropology departments– not a huge blockbuster off-campus). That theory holds that one’s world-view (galaxy-view in this case) is mostly shaped by the language we speak. And as Dr. Banks eventually learns this is a key concept. Linguistic determinism is to Arrival what relativity was for Interstellar: the hard science part of science fiction, although arguably, like Christopher Nolan, Villeneuve is really more interested in the emotional truths the encounter reveals in the humans than in the space creatures.. Far from the pop mythology of far away galaxies and Marvel–style action, Arrival makes for an intellectually satisfying viewing experience, not a crowd pleaser perhaps but a vehicle sure t deliver intense pleasure to fans of the genre. In the end the plot twists steer Arrival toward time travel of sorts - and a cosmic dimension perhaps signaled here also by the presence of Terrence Malick’s long-awaited documentary Voyage of Time. With his film Villeneuve’s has crafted a science fiction drama that is gripping as it is optimistic and aspirational.